October 1st, celebrated every year since 1960 as the day set aside to commemorate the Independence of Nigeria from the British.The Federal Government has declared Monday the 2nd as a public holiday since this year’s Independence Day fell on Sunday. This is to enable Nigerians have enough time to celebrate Nigeria with friends and families. 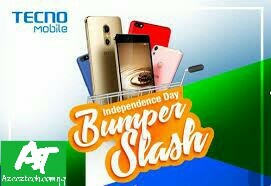 During this time many brands normally reduce the prices of their products as a way to mark the memorable day and on this list this year is a major mobile and smartphone producer; The Tecno Mobile company. This foremost leading Smart Phone producing company in celebration of Nigeria’s Independence and her fans, declared a 5-day price slash on some of her flagship products plus gift items from the 2nd of October to the 7th of October,2017. The phones on the promo list include Phantom 6, TECNO Spark, Camon CX and CX Air. For example the phantom 6 which cost about N70, 000 before has been slashed to N63, 000 and customers who buy the device will also be going home with a free pressing iron as a gift. The TECNO Spark will get a gift pack and if you buy the Camon CX or the CX Air, you will be rewarded with an Iflux rechargeable lamp.